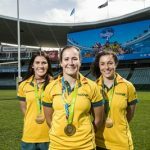 The Olympic Gold Medal winning Australian Women’s Sevens rugby team will play in front of a packed home crowd this Summer, with the announcement today that the Sydney 7s will include a fully accredited Women’s event for the first time. 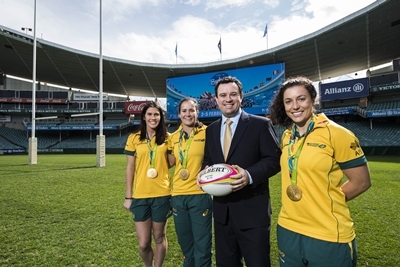 Minister for Sport Stuart Ayres said the Sydney 7s event will be the must see sporting event of 2017. “The incredible skills of the Women’s Sevens team was one of the highlights of the Rio Olympics, and it’s a massive win for Sydney to play host to a full Women’s tournament,” Mr Ayres said. Australian Rugby Union Chief Executive Officer, Bill Pulver said: “The success of our Women’s Sevens team in Rio captivated the nation and put the sport of Rugby Sevens on the map, both here in Australia and all over the world. Destination NSW Chief Executive Officer, Sandra Chipchase said the event promises to attract visitors from around Australia and the world to Sydney. “The inaugural Sydney 7s was one of the most popular events of the year, and featured our Women’s Sevens team playing a three-match series against Ireland. NSW is now to build on this for a full tournament to showcase the game’s best female players,” Ms Chipchase said. The Sydney 7s event will be held from Friday 3 to Sunday 5 February 2017 at Allianz Stadium with tickets on sale from Tuesday 11 October 2016.